Coulrophobia is a fear ripe for exploitation in horror movies, most famously done in Tommy Lee Wallace’s adaptation of Stephen King’s It (1990), which transformed colourful clowns into sheer terror for a generation. 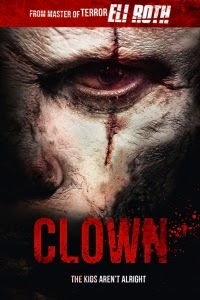 It’s perhaps a deeper and darker anxiety that is actually at play in Jon Watts’ Clown (2014), though, which eschews the maniacal jester archetype utilised in Pennywise in favour of a old myth about child abduction from Scandinavia. Giving its title character the kind of treatment that Santa Claus received in Rare Exports (2010), this droll but largely limp horror-comedy uses its demonic antagonist as a catalyst for the story of a father struggling against the desire to hurt his child. It all begins with an act of affection. A last-minute cancellation leaves the birthday party of the clown-mad Jack (Christian Distefano) without any entertainment, loving dad Kent (Andy Powers) comes up with a plan. A realtor out at one of his properties when he gets the call, he heads to the basement and rummages through the discarded belongings hoping to construct himself an outfit. Conveniently, in an old trunk he finds a fully-formed old-fashioned clown costume and putting it on, he rescues his son’s party as ‘Dummo’. The next day, however, he cannot remove the harlequin’s onesie, or wipe the make-up from his face. Growing ever more desperate he tracks down the former owner (a hirsute Peter Stormare) who spouts exposition and informs him of a terrible curse – the only cure for which is beheading. There’s the undeniable spectre of domestic abuse lurking behind the supernatural – even going as far as Jack’s wife, Meg (Laura Allen), covering for him even after he has committed atrocious acts. That his pursuit of his quarry rarely manages to raise the pulse is a problem, however. Children in peril are generally a sure-fire way to guarantee tension and thrills, but Clown never gets overtly scary – even the costume failing to chill – and the horror lying largely in the notion of trusted parent turning blood-thirsty monster. Perhaps the most enjoyable moments actually come before the transformation begins, as Trent comically attempts to first extricate him from his new clothes and then to blend in to civil society whilst he uncovers the truth about his situation. A scene in which he tries to cut himself free with a knife ends in ghoulishly funny fashion and the image of him in dark glasses and a hat to cover his rainbow wig raise a titter. It remains fairly generic in tone, however, and one can’t help but think that some gruesome invention – a la ludicrous British clown-slasher Stitches (2012) – might have given it a bit more character. The full Glasgow Film Festival 2015 programme, ticketing details and more can be viewed at glasgowfilm.org.